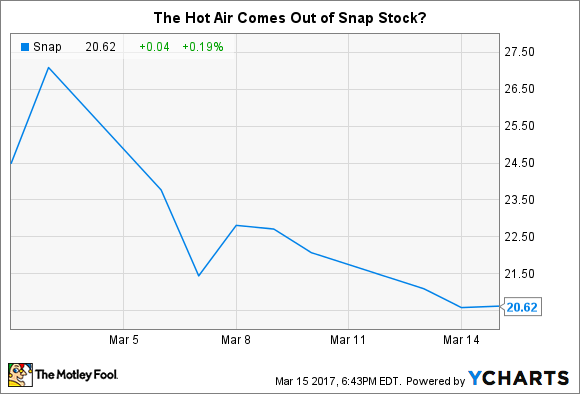 As similarly high-flying IPOs, Snap must do this in order to avoid Twitter’s stock price struggles. The jury is still out on Snap (NYSE:SNAP) stock. After soaring in its first day of trading on secondary markets, Snap shares have fallen below their first-day opening price of $24 per share. However, the shares still remain above their initial public offering (IPO) pricing value of $17 per share. Numerous commentators -- myself included -- have argued that Snap shares are observably overvalued in the near term, because the arithmetic just doesn't add up. However, the company's long-term trajectory could see it become the next roaring social-media success, like Facebook (NASDAQ:FB), or struggle to define itself, like Twitter (NYSE:TWTR). Here's what Snap needs to do to avoid succumbing to a fate like Twitter's. Unfortunately, the company's current size and the growth rates it demonstrated in its IPO prospectus suggest Snap may not enjoy the kind of mass-market opportunity that has propelled Facebook into the corporate stratosphere. Here's a quick comparison of Facebook's and Snap's daily active user (DAU) counts from each of their IPO prospectuses. Data source: Facebook and Snap Inc S-1 filings. Keep in mind, Facebook was nearly eight-years-old when it conducted its May 2012 IPO, and Snap is about seven-years-old today. Additionally, Twitter reported having a frustratingly vague "more than 100 million daily active users" in its own S-1 filing, when it, too, was about seven-years-old. Moreover, Snap's growth is slowing, which also suggests that acquiring a Facebook-sized user base -- and profit base, by extension -- is unlikely under present circumstances. Snap detailed its growth-rate history, noting that DAU growth rates had halved from 92% in December 2014 to 46% in December 2016. If the company can't maintain that mid-double-digit growth rate for a very long time, or develop an implausibly profitable advertising business overnight, the basic arithmetic underpinning its whopping valuation seems likely to collapse under its own weight. Given the number of Snap clones Facebook continues to launch across its ecosystem -- four at last count -- Snap will need a way to stay ahead of the competition and its own market cap. Thankfully, the company isn't operating in a vacuum, and has hinted that it does not plan to sit idly by as this situation unfolds. Thankfully, Snap has signaled to the marketplace and investors that it understands this exact dynamic. In its S-1 filing, Snap shrewdly defined itself as a "camera company" rather than a mobile app for sharing disappearing images. Though a cynic could argue that Snap did so to paint as grand a picture as possible during its pre-IPO road show, doing so also could suggest the company is aware of its need to evolve in order to continue to acquire new users, grow its business, and support its stock price. In fact, I recently saw a tweet from famed venture capitalist Chris Sacca that I thought nicely summarized the real investing narrative that anyone interested in owning Snap stock needs to understand. I couldn't agree with this more. Like it or not, buying Snap at its current valuation is an explicit bet that CEO Evan Spiegel and his team can continue to rollout hit products that will attract new hoards of users. Without that, Snap can eventually become a very profitable company, but it's also unlikely the company will be able to justify its lofty valuation in the near term. Spiegel is indeed a gifted product leader. No one disputes that. He created one of the most popular tech products in the world today as an undergraduate at Stanford. That's a rare level of success few of us can ever hope to attain. However, the tech industry also has a long and riddled history of failed second acts. Lightning doesn't always strike twice, a parable that Twitter's recent struggles exemplify. Twitter's co-founder and current part-time CEO Jack Dorsey enjoys a reputation as a guru himself. He founded Twitter and Square. However, for whatever reason, Dorsey has been unable to reignite the kind of major product innovation during his current tenure that will truly move the needle for the company. Everyone knows exactly what Snap needs to do in order to have this story enjoy a happy ending. However, it's important to note that the odds of doing so might not be as favorable as some investors think. Should Snap fail to live up its current "golden boy" status, current shareholders will likely be in for quite a route. Just ask Twitter.